Everybody can enjoy themselves in Amsterdam! So, you’ve finally decided on Amsterdam as your next city trip destination! Great fun, especially if you haven’t been here before. To make sure you fit in as much as possible during your stay you will really need to know what is going on during your visit and which activities will fit in with your itinerary. 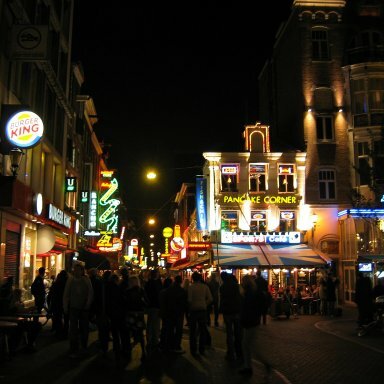 Amsterdam is a versatile city and there is something for absolutely everyone. But how do you plan the perfect trip? I have included some top tips in this “Things to do in Amsterdam” section. The weather could be an issue during your visit to Amsterdam. In the Netherlands you should never assume that the weather will be wonderful, even in the summer. Keep this in mind when you plan your stay. Make sure you always have an umbrella in your bag so that you’re always prepared for a sudden, unexpected shower. Amsterdam is the perfect city to discover on your own. The centre is quite compact and you can move from one place to the next within a short space of time. Do you want the freedom to plan your day at your own place? Then I advise you to rent a bicycle. Cycle paths can be found throughout the city and you will probably reach your destination more quickly by bike than by car or public transport! Is cycling through Amsterdam’s busy traffic not for you? Then a boat trip might be a better idea. Travel along the Amsterdam canals and listen to the great and varied background information about this wonderful city. All boats are covered, so even if it rains you can still have a great day out! By adding a few free activities to your itinerary you are sure to stay within budget and get a lot done. The most obvious choice is the Vondelpark; enjoy a stroll along the canals and stop for a picnic on the grass. Amsterdam also organises free cultural activities. The Open Air Film Festival is a really good example; take a blanket and a bag of popcorn and enjoy the amazing atmosphere while watching a movie on a big screen. For a stunning (free) city panorama go to the roof of the NEMO science centre. You will be able to spot Centraal Station, the harbour and the VOC ship from here. 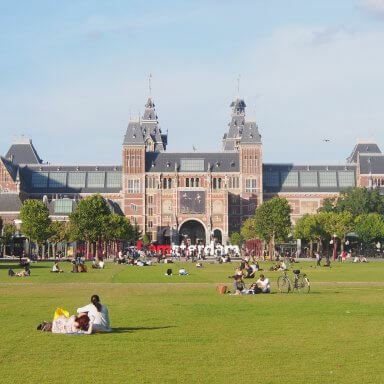 A picnic on Museumplein on a sunny day is also a lot of fun and totally free. 1. Enjoy beautiful Vondelpark. With a little luck you will get to listen to a free open-air concert in the park’s theatre! Restaurants, cafés, bars, and clubs all open their doors in the evening. Amsterdam caters to all budgets; bistros and diners sit next to Michelin star restaurants. After dinner you can drink a colourful cocktail in one of the many cocktail bars, then party in a club to finish off the perfect day in style. 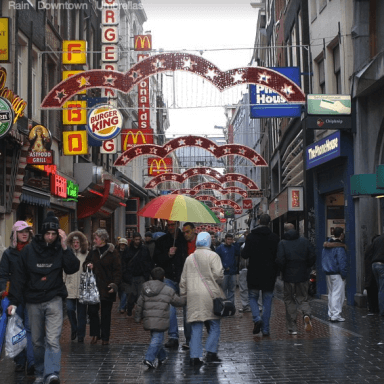 Rembrandtplein is known as a tourist trap but don’t be fooled by the crowds! The clubs in this area are world-class. Escape often hosts huge names and they always have brilliant parties every weekend. Air and Abe are also well-known venues on the Rembrandtplein. Expect to see household names like Afrojack, Fedde Le Grand and Sunnery James & Ryan Marciano. Keep in mind that you will usually have to pay an entrance fee, and beer prices are slightly higher than average. For a really special drink in a really special place, go to the Xtracold Icebar. Put your gloved hands around your glass while you sit in a bar made completely out of ice to start your evening with a bang. Seen enough of the city? There is a lot to do in Amsterdam’s outskirts! Visit the authentic Dutch villages of Volendam and Marken & Zaanse Schans or visit the world-famous Keukenhof. 644 visitors rated What to do in Amsterdam average 4.5 stars out of 5.